The glass technology company recently boosted its dividend. But there's much more to come for patient investors. Shares of Corning Incorporated (NYSE:GLW) are up nearly 14% so far in 2017, most recently helped by signs of accelerating momentum for the glass technologist's business when it released fourth-quarter 2016 results in late January. Then only a week later, the company further stoked investors' enthusiasm by increasing its quarterly dividend by 14.8%, to $0.155 per share. 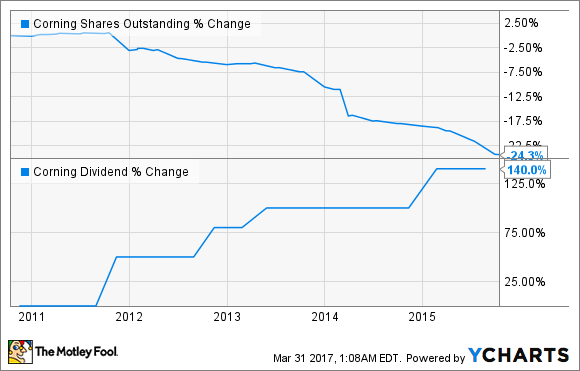 That brings Corning's annual dividend payout to $0.62 per share, good for a healthy 2.25% yield as of this writing. But that increase is only the tip of the iceberg for Corning investors today. Corning Chairman and CEO Wendell Weeks referred to the latest boost to the payout as merely "another significant step toward meeting our goal of distributing more than $12.5 billion to shareholders through a combination of share repurchases and dividend increases of at least 10% annually through 2019." By that measure, Corning's annual dividend payout will be at least $0.75 per share two years from now -- perhaps higher, if the size of its latest increase is any indication -- which would represent an even better 2.72% yield on the cost basis for investors who buy now. That's not to mention Corning's ambitious share repurchase efforts. Since Corning initially outlined its long-term Strategy and Capital Allocation Framework in October 2015, the company has already returned $6 billion (of its $12.5 billion targeted amount) to investors through dividends and repurchases. We should also keep in mind that Corning seems likely to continue its share repurchases and dividend increases well after 2019. In the five years leading up to the unveiling of its new Strategy and Capital Allocation framework, the company not only reduced its number of shares outstanding by more than 24% through share repurchases, but also more than doubled its dividend payout through steady annual increases. It seems only reasonable that Corning would continue these long-standing patterns assuming the its business remains healthy. GLW Shares Outstanding data by YCharts. Speaking of which, Corning has simultaneously promised to invest $10 billion toward fortifying its business and industry leadership through research, development, and engineering initiatives. Most recently, for example, those initiatives have opened the door to a significantly expanded addressable market for Corning's popular Gorilla Glass product -- which is primarily known as the cover glass of choice for the world's most popular mobile devices -- by propelling it into the automotive industry. For the 2017 Consumer Electronics Show in January, Corning even built its own fully operational electric vehicle prototype to showcase the various novel, cost-efficient applications of its high-tech products. Those applications range from ultra-light, massively durable Gorilla Glass hybrid windshields, windows, and sunroofs -- all of which feature user-controlled tint capabilities -- to a Gorilla Glass-covered dashboard, steering wheel with a built-in fingerprint sensor, and a curved glass center console with built-in wireless charging and temperature sensors. Of course, those products are all in the earliest stages of potential adoption. But in the meantime, Corning is already enjoying significant traction for its recently launched Gorilla Glass 5 product; Specialty Materials sales rose 22% year over year last quarter on record Gorilla Glass volume. Meanwhile, Corning is enjoying strong demand and continued price moderation for LCD glass, which comprises the bulk of sales (up slightly last quarter) and earnings (up 18%) for its core Display Technologies segment. And growth in both revenue (up 11% last quarter) and earnings (up 85%) from Corning's optical communications business have remained robust thanks to demand from its North American carrier network business and fiber-to-the-home solutions. In the end, with Corning not only investing heavily in its strong core businesses, placing promising irons in the fire to capture future incremental growth opportunities, and given its ambitious plans for continued capital returns, I think Corning stock stands to handsomely reward investors willing to buy and hold as its growth story continues to play out in the coming years.